Intimidation? Possibly. I am always wary of someone protesting my sketching, particularly when I’m sitting directly across from them. No one has every said a thing. This woman was so pretty that maybe I didn’t want to stare. I did her an injustice. This entry was posted in Personal Stories and tagged art, artistic process, creativity, drawing, intimidation, pen and ink, portrait, portraiture, sketch, visual art. Bookmark the permalink. I always feel apprehensive when I’m sketching someone. I’m afraid they’re going to notice what I’m doing and be offended. I know what you mean. I try to memorize contours and look at the subject as little as possible. It is a bit nerve wracking though. Thanks for your comment, Judith. No one cares if you sketch them in public. You don’t need permission. They might care if you take a photo. They can’t feel someone is watching them either. It’s natural to look around when you’re eating because it’s an instinct left over from the cave man days which protected people from losing their food to scavengers. 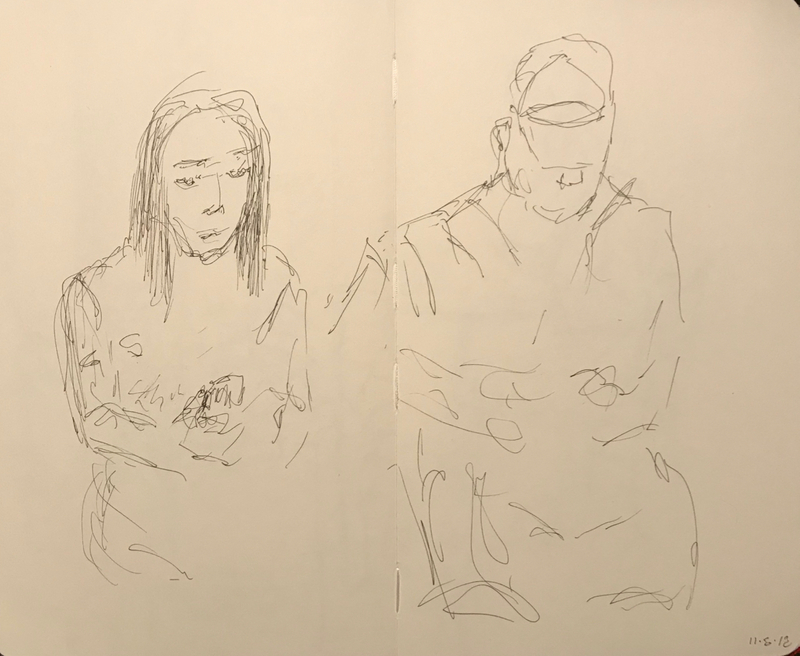 My tip is, listen to an iPod so you feel less self conscious when you sketch from life in a public place. Your favorite music can take you into your own separate place but you will still be able to observe people and draw. Thanks, Chris. Interesting that you mention taking pictures. I was approached by two teenagers who asked why I was photographing them. I didn’t know what they were talking about, as I was taking pictures in the local train station and hadn’t seen them. Thanks for your suggestions. That’s funny. Maybe the teens thought you were spying on them. Paranoia strikes again!